Find pictures of Lean-to and discover interesting facts and information about the Lean-to. Learn about the structure of the Lean-to with pictures and images together with facts and information about the tribes who used them, including the Bannock, Ute, Paiute, Miwok, Apache, Crees, Shoshone and the Nez Perce. What does the term Lean-to shelter mean? Definition: The Lean-to was generally a temporary, make-shift shelter that was quick to erect using raw materials that were readily available in the location. A lean-to was a small shelter providing a place to sleep out of the cold night air and the elements ensuring survival without the risk of 'exposure'. 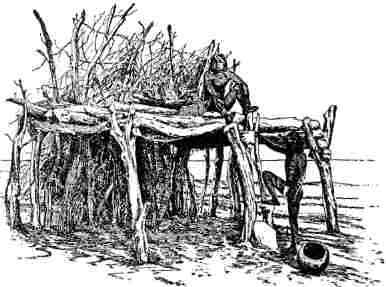 Lean-tos were free-standing beams made of materials such as wood or even whale bone that were layered against a log or large rock, lashed together, and covered in brush or a hide. The typical Lean-to had a slanted roof and an open entrance and generally leaned against something for support and added protection. Many tribes used these open-sided structures for work areas whilst traveling. Why was the Lean-to built as a Native Indian shelter? Every tribe choose a type of housing to suit their lifestyle, the climate, the environment and the natural resources (known as biomes) that were available to them. The Lean-to was quick and easy to build making use of a variety of materials including trees, leaves, saplings, branches, grasses and brush. These types of make shift homes were typically built to offer protection and a safe place to sleep on hunting or fishing trips and used by many Native American Indian tribes. The Great Plains tribes were the main exceptions, as they erected Tepees using the portable framework and tent covering from location to location. Some other tribes used Wickiups, but these took longer to build and required digging that was tiring and time consuming. Brush shelters were a similar type of rough and ready temporary accommodation. How was a Lean-to built? The materials used to build a Lean-to were poles and long sticks covered in brush and secured with fiber. The picture shows a Lean-to that is leaning against cliff rocks, it is strong, well made and suited as a more permanent type of shelter. However, typical lean-to shelters were small, and intended just for sleeping. To make these types of shelters long, thin poles, or saplings (young trees) or logs were gathered, cut to size and stripped of bark. The poles of the frame leaned against each other and were lashed together with tough fibers and bound into place. One side was left open as the entrance. The site chosen for the construction was flat and located near a fresh water supply whenever possible. Cooking was usually done outside. The shapes, sizes and styles of lean-tos varied considerably according to the requirement of the occupant. Some western Subarctic Indians constructed double lean-tos with two roofs meeting in a peak. A lean-to was constructed from any materials that were easily accessible. Many Native Indians were great fishers and constructed a variety of canoes. On long fishing trips the fishers would use a canoe to make a lean-to style of shelter.